VAPE KOREA EXPO, which is the only vape show held in Korea, will feature the latest products and technologies in vape industry. 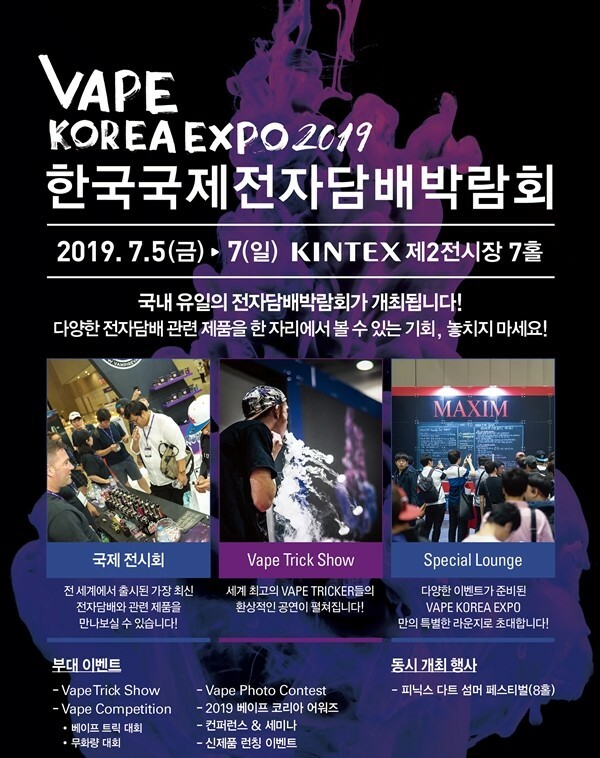 VAPE KOREA EXPO is becoming as a 'MUST-VISIT-SHOW' for the vapers in Korea , with a larger scale of exhibitors, and with more diverse programs,. The event also includes many exciting programs for B2C visitors such as 'Vape Trick Show', 'Vape Trick & Cloud Chasing Competition', ' Vaping Photo Contest' and 'Vape Korea Awards'. Visitors will be able to participate the show and experience diverse vaping culture. VAPE KOREA EXPO will serve as an unique platform for Korea and international brands, manufacturers, distributors, retailers and vapers to gather and interact actively in one place. If you are interested in sponsorship and exhibiting opportunities for upcoming event, please contact VAPE KOREA Team or visit our website for more details.